It’s Christmas in July with that Miss Nichol! Check out this amazing page she did to showcase all the Christmas photos she gets each year. I just looooove how Nichol ‘sets the scene’. And I adore the laced up skates! 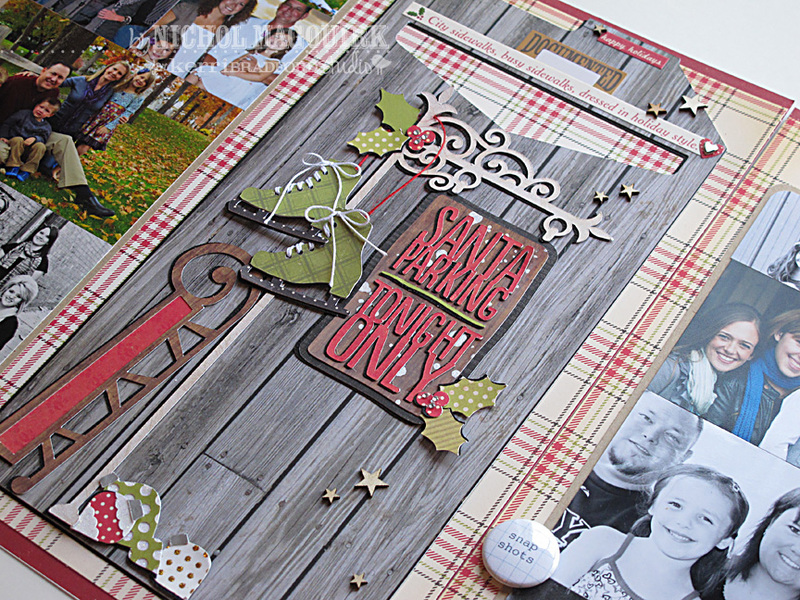 Even though the temperature is 103 degrees this July day, I thought it would be fun to dream of cooler temperatures and celebrate the holidays by creating a little “Christmas in July” layout. I keep an album of all the Christmas photo cards we receive during the holiday season and I still had a few photos that needed a home. Typically I add the names of who’s who in each photo (and I will this time too!) but I ran into a bit of a printer malfunction (aka I ran out of ink and had to order more…boo!). Once I print the names on kraft cardstock, I’ll cut them into strips and lay them over the bottom of each coordinating photo. Nothing fancy, just a nice way to remember and celebrate friends and family every year! I adore creating die cut “scenes” by mixing and matching shapes from several different kits. I used 8 designs from 5 of Kerri’s kits. 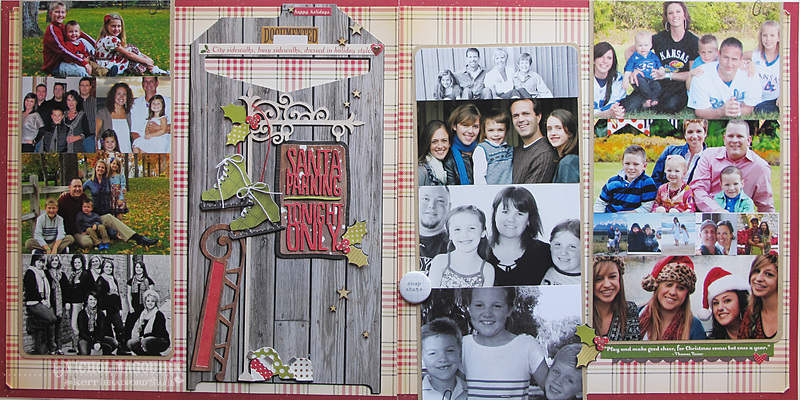 I used the photo frame from the This & That Family kit as the “base” of my “scene” by resizing it big. Then I cut the pieces from lots of different Christmas colored papers and added a black die cut “shadow” to each for depth and dimension. Shadowing is my “go-to” technique for giving die cuts that little something extra that really makes them the star of the design. 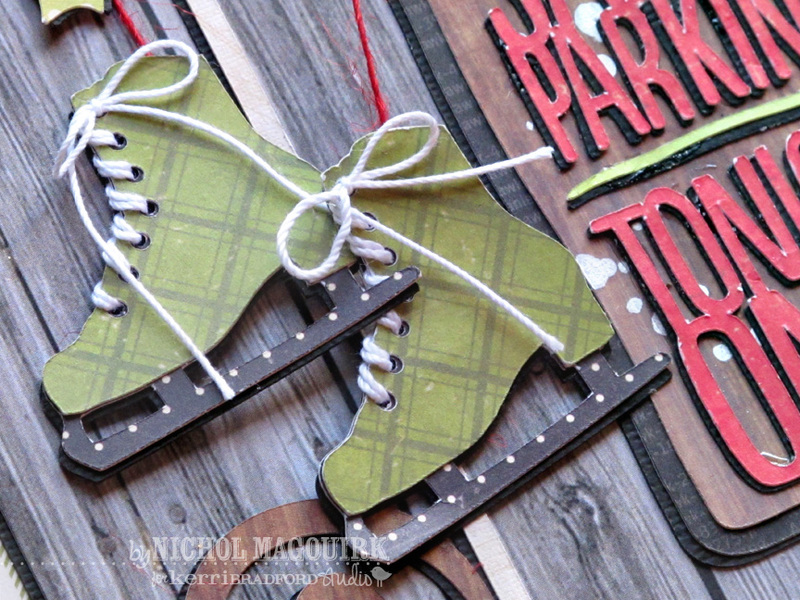 :) To give the ice skates a more realistic look I threaded string through the die cut holes and “laced them up”. Small touches like this really take your die cuts up a notch. White Studio Calico Mister Huey mist on the sign gives it a “snow” look perfect for a winter-themed layout. If you’d like to see the other layouts in my Christmas Cards from Friends and Family album, click HERE (scroll down for all the page links). I used one of Kerri’s titles on THIS page as well. So versatile and fun! Nichol never fails to amaze and I always love the details she adds to her layouts. I love this, what amazing work!